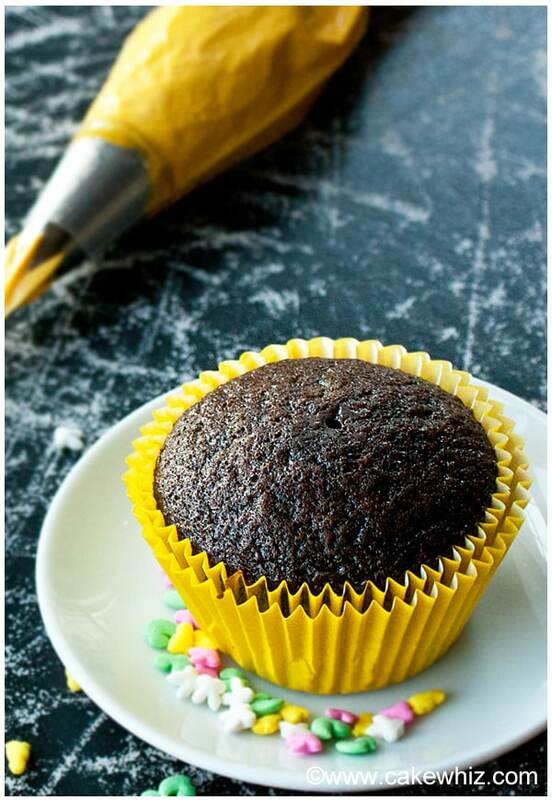 This is the best chocolate cake and cupcakes recipe! They are quick and easy easy to make! Very soft and moist and perfect for birthday parties. Since I have received a few requests for my chocolate cake and cupcakes recipe, I am going to devote this post to just that. If you have been looking for the perfect chocolate cake recipe, I assure you your search has come to an end! I have tried many recipes and always find myself coming back to my true and tested recipe. Some of the recipes I tried online were not that bad but some were are SO BAD that I don’t even have the right words to describe them. The recipe I am sharing today belongs to my mom and I swear it NEVER fails. It’s SUPER MOIST with a very nice chocolate flavor that’s not too over-whelming, nor too subtle. It’s also NOT excessively sweet and pairs well with many of my frosting and filling recipes. By the way, my sister told me if they ever make a rehab facility for “chocoholics”, she would send me there …hahah. I am keeping my fingers crossed that such a place NEVER opens…lol. I don’t think I would last too long there since I swear ate like 6 of these cupcakes in one sitting yesterday…lol. 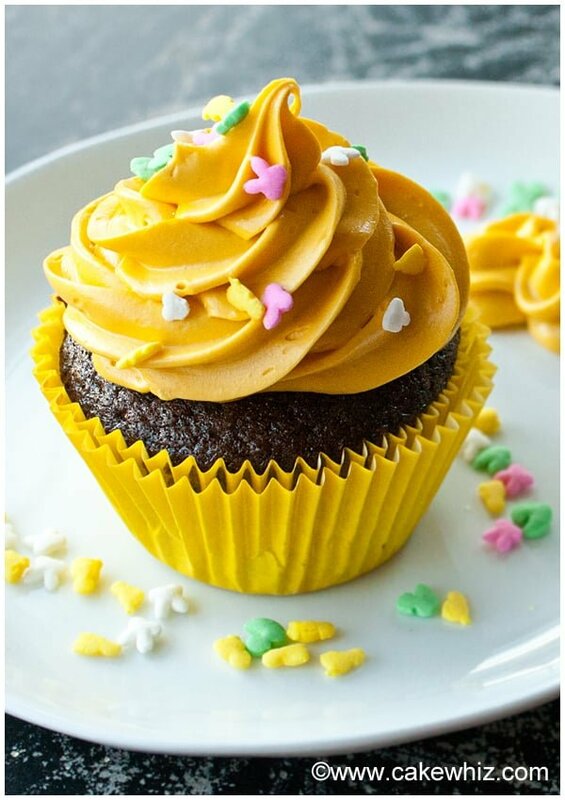 Best of all, this recipe is so VERSATILE that you can use it to make CAKES as well as CUPCAKES! Only the baking time is different. 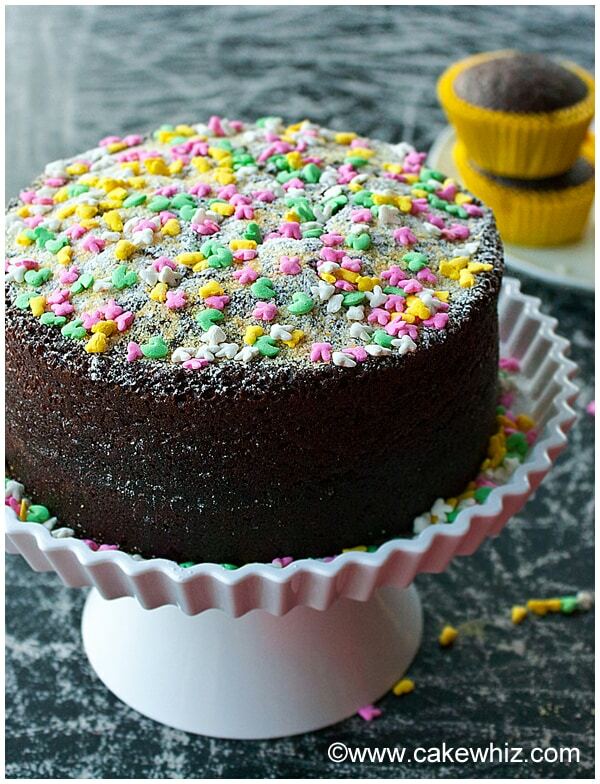 I just dusted some powdered sugar on top of this cake and tossed some sprinkles to give it a pop of color. In a deep bowl, add flour, cocoa powder, sugar, oil, vanilla extract, eggs, milk, cinnamon powder, salt, baking powder, baking soda and mix everything. Add hot water. I usually microwave it in the microwave for 2 minutes. Pour this batter into a greased/floured pan (Dimensions: 8×3). Only fill your pan halfway and use the remaining batter for some cupcakes or another mini cake if you like. Bake at 350 degrees for about 45 minutes or until an inserted toothpick comes out clean. If you are making cupcakes, pour this batter into cupcake liners and fill them three quarters of the way. 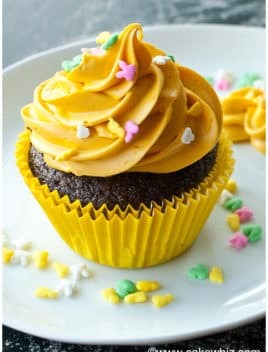 You can easily get 24 cupcakes with this recipe. Bake at 350 degrees for about 17-20 minutes or until an inserted toothpick comes out clean. DO NOT bake both the trays at once. Bake one tray of cupcakes and then bake another. Whenever I bake both the trays together, the cupcakes don’t get fully baked. Frost the chocolate cakes and cupcakes with icing and enjoy! Pour your batter into a pitcher and use that to pour batter into individual cupcake liners. I find this easier and not as messy as spooning individually. This recipe will either make 24 cupcakes or a single 8×3 round cake. Love it !! I made 24cupcakes it was so easy to make and moist and delicious. These cupcakes turned out amazingly! My only problem has been that they are sticky. Could it be the oil or maybe not baked long enough? Happy to hear they turned out well. I am not sure why they were sticky for you. 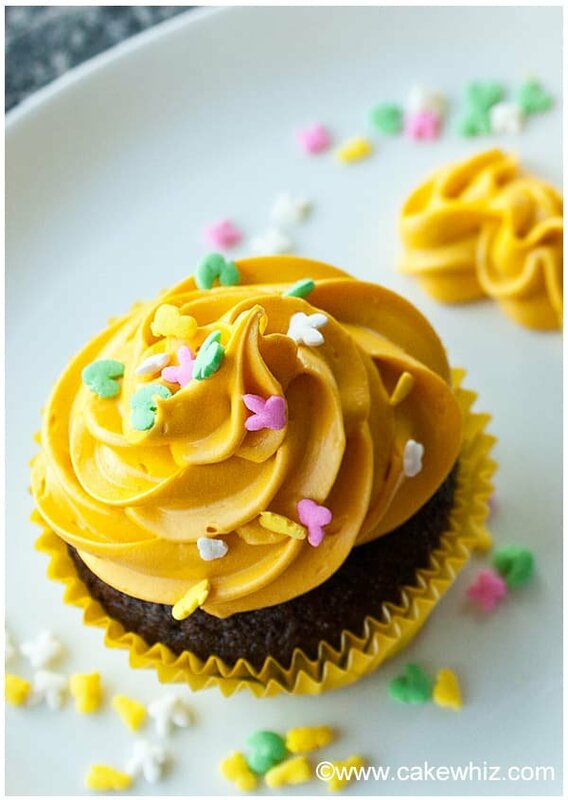 What cupcake liners do you use? I use Wilton’s liners and never have issues with sticking. These were really fun to make. Everybody goes into the pool, mix, pour, bake, and eat. Great for a kids project. Easy!